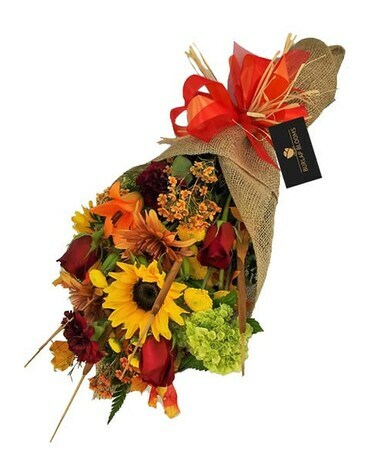 A wrap of Indian Jute is filled with seasonal Fall flowers and foliages, including roses, sunflowers, hydrangea, pomps and wax flowers. The look and feel is sublime, Autumnal and versatile. Perfect for a gift to the Thanksgiving chef or even a just because arrangement for the home or office.